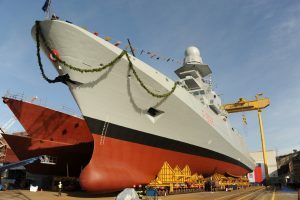 The fifth platform in the General Purpose (GP) variant of Bergamini-class multipurpose frigates was formally launched at Fincantieri’s Riva Trigoso shipyard on 26th January, to be delivered in 2020. 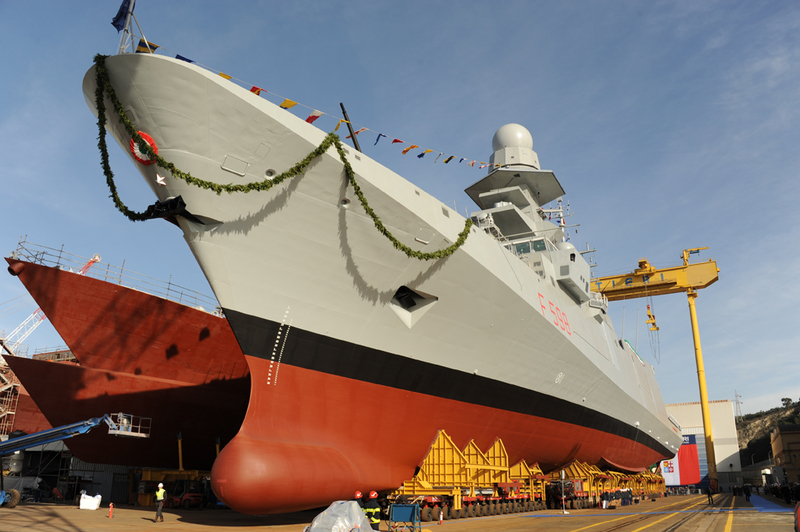 Alongside the under-construction future second-in-class multirole combatant patrol vessel or PPA (Pattugliatore Polivalente d’Altura), which first-of-class, Paolo Thaon di Revel, will be launched by late May – early June 2019 at Fincantieri Muggiano shipyard at La Spezia. 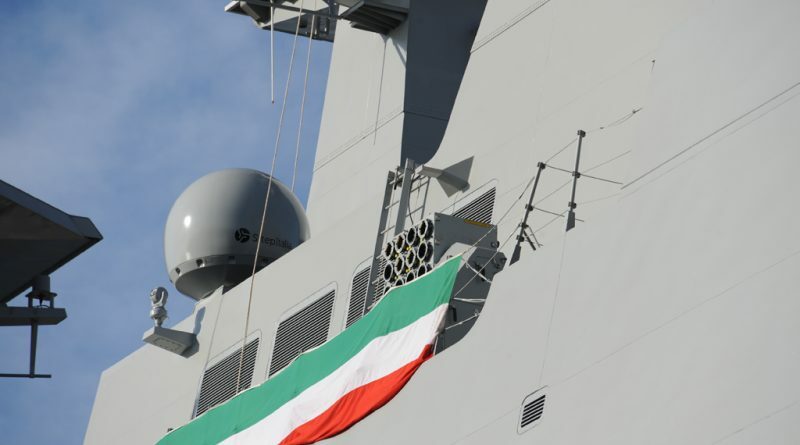 The event allowed to make a point on the Italian Navy frontline ship developments. Designed, built and equipped by Orizzonte Sistemi Navali (OSN) joint-venture between Fincantieri (51%) and Leonardo (49%), under the Italian/French Multirole European Frigate (FREMM) program managed by OCCAR’s international joint-armament procurement organization on behalf of both countries and navies, the Spartaco Schergat (F 598) 7,600 tonnes GP frigate has respectively a 144 meters length and 19.7 meters beam with a propulsion package based on a CODLAG (COmbined Diesel-eLectric And Gas) configuration, allowing for both slow and quiet ASW patrol and high-speed operations up to 27+ knots. 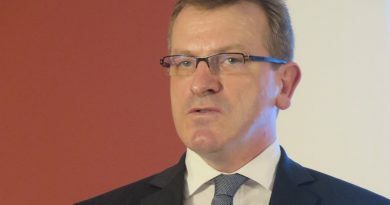 The comprehensive combat system is centred on Leonardo’s Athena Command Management System (CMS) and Fincantieri’s Seastema Ship Management System (SMS) controlling a sensors and weapons package including the Leonardo 127/64 mm LW (Lightweight) main gun with Vulcano guided and unguided long-range ammunition, eight MBDA Teseo Mk2/A anti-ship missiles, Leonardo 76/62 mm Super Rapido gun with Strales guided ammunition, two 25 mm remotely-controlled guns, and the MBDA Italia ESD (Extended Self-Defence) surface-to-air weapon system based on Aster 30 missile and Leonardo MFRA multifunction AESA radar, two gun fire control systems and SASS IRST, alongside with an EW suite provided by the SIGEN consortium between Elettronica and Thales and including RESM/CESM, RECM and Leonardo decoy launcher, and Thales/Leonardo integrated hull-mounted sonar suite. The GP variant also features a launch and recovery stern ramp for an 11 meters special forces boat in addition to 7 meters and 11 meters side-launched boats. 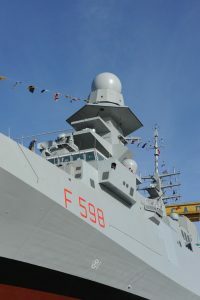 Both the GP and ASW variant Bergamini-class frigates have additional accommodation in addition to that of the crew, such as operational spaces for a task force command group, the flight detachment, and San Marco marine boarding teams and augmentees, for a total of 200 personnel accommodation. A new technologies insertion and obsolescence management roadmap saw the introduction on board the ninth Bergamini-class multirole frigate of a new version of Leonardo’s Decoy Launching System called OLDS 20 based on the same trainable launcher but with 20 mortar stations (instead of 15 rockets and four mortar stations) capable of firing a wide range of decoys including not only the full range of 130 mm IR and RF decoys available but also ASW, obscurant or other bespoken payloads including non-lethal countermeasures. The new frigate will also have a new damage control panel station. 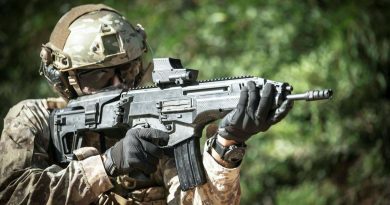 These enhancements come along the new full solid-state and more capable 2D SPS-732 air and surface surveillance radar to replace RAN30X/I RASS model and the new SIR-M-CA IFF interrogator system with conformal array (instead of phased arrays) compliant with STANAG 4193 Edition 3, already on board the Bergamini-class frigates from the sixth platform. Starting from the Alpino ASW-variant and fifth-built FREMM, delivered to the Italian Navy in 2016, the “Zero ANT” (activities not terminated) objective has been achieved by Italian MoD’s Directorate of Naval Armaments/OCCAR. 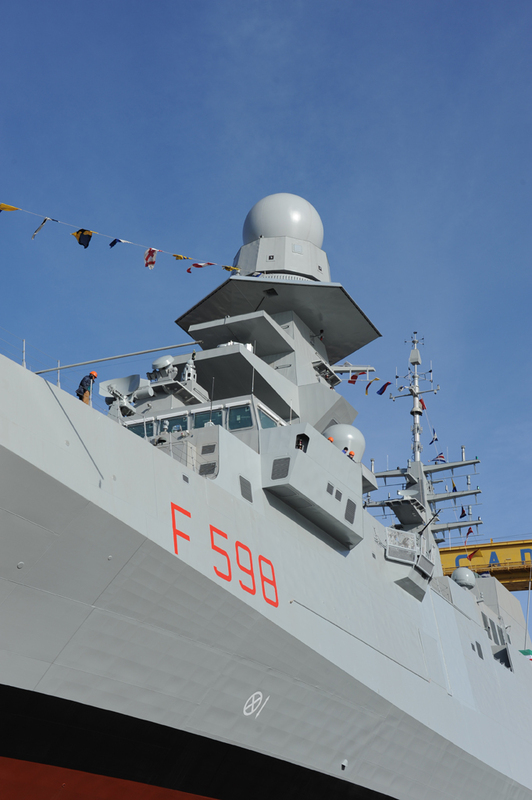 In order to reach this milestone in line with the contractual schedule, the final official acceptance of the eighth (GP variant) frigate Antonio Marceglia is scheduled in April 2019. Being deployed in international and national at sea operations worldwide, including “Mare Sicuro” in the Mediterranean Basin and European Union antipiracy “Operation Atalanta” in the Gulf of Aden and the Indian Ocean, as already performed by other Italian Navy’s FREMM platforms, the Carlo Margottini ASW variant platform left Italy on 17th January for a deployment in the Middle East region waters and ports to conduct surveillance and maritime security operations as well as promotional activities in support of national naval defence industry. The frigate will call in Djibouti, Karachi (Pakistan) to participate to Aman multinational naval exercise, AbuDhabi (UAE) for IDEX/NAVDEX 2019 exhibition, Dammam (Saudi Arabia), Kuwait City (Kuwait), Doha (Qatar) and Muscat (Oman). Fincantieri is promoting a customized version of the FREMM ASW variant for the US Navy’s FFG(X) program, which detailed design and construction contract is planned to be awarded in fourth quarter of US DoD Fiscal year 2020.